Your brother has been the biggest prankster of all times. But then, you had someone as gentle as your Bhabhi you came as your knight and became your greatest secret keeper. Let your Bhabhi know that you hold her in high regard by presenting a Lumba Rakhi for Bhabhi and making her feel more adored and special. The auspicious festival of rakhi is the most awaited festival of brothers and sisters which is observed every year in the month of Shravana on a full moon day. In India, this festival is celebrated with much fervor to cherish the eternal bond between brothers and sisters. However, the rituals of celebrating this festival differs from region to region. One such prominent and unique rakhi ritual is of the Marwari community according to which the sister ties a lumba rakhi on the bangle of her brother’s wife or sister-in-law. This Marwari custom of tying a lumba rakhi on Raksha Bandhan is catching up among other communities too as this tradition holds a special spiritual significance. So, to make your Raksha Bandhan a memorable one, FlowerAura brings to you a wide range of rakhi sets online from where you can buy lumba rakhi online comfortably seated at your home. To order a bhabhi rakhi online from FlowerAura, all you have to do is to visit our website, pick your favorite rakhi, and place your order. Once your order gets confirmed with us, our delivery team will make sure to deliver your ordered gifts to your doorstep just within four hours of your order placement. According to the Marwari Raksha Bandhan custom, the ladies rakhi lumba is believed to play a significant role in keeping relationships strong with loved ones. The tying of lumba rakhi on sister-in-laws hand is believed to foster relationships within a family. So, by tying a lumba rakhi to your bhabhi, you are not only making your bond stronger with your brother but also with the entire family. Another importance of lumba rakhi is that when your brother gets married, your sister-in-law becomes his ardhangini which means your sister-in-law reflects half of your brother’s body. Therefore, no religious ritual can be complete without your brother’s wife. When you tie a lumba rakhi to your sister-in-laws bangle, you are actually wishing your bhaiya and bhabhi a secured and blissful marriage life ahead. By tying a lumba rakhi to your bhabhi, you are also accepting your sister-in-law as an integral part of your family. Thus, on Raksha Bandhan make sure to strengthen your bhaiya-bhabhi’s marital life and bring wedded bliss to the couple by ordering a lumba for bhabhi. The lumba Rakhi is a traditional Rakhi which is well ornate with sequins, mirror work, and danger. 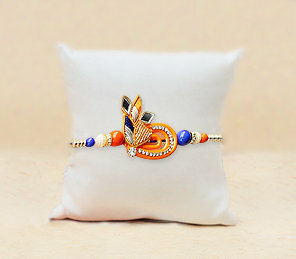 We have the most appealing collection of lumba Rakhi at Floweraura. A lumba stands for a special connectivity with your brother's wife and while you tie it to her bangles you pray for her healthy and successful marriage. Why not express your love for her with the most beautiful designs available with us? You can choose from the many designs and varieties available on our online portal. People now send rakhi for Bhaiya bhabhi to express the undifferentiated love for both. Our free home delivery service will make sure that Rakhi for both your brother and sister in law reaches on time. Using our web portal you can send rakhi gifts to Allahabad or any other city if your loved brother is living away with family. We are the best gifting solution in the town facilitating free shipping as well. So when you are looking for gifts this Rakhshabandhan we are just a click away! The gift you will choose will be delivered with the utmost affection and care that too with an option of instant delivery. Interestingly, the celebration has added gifting to sister in laws and adds significance when you send Lumba Rakhi for bhabhi that augments sweetness of relations. You must have been buying a special Rakhi for your bhabhi all this while. Now you have grown up and another member has been added to your family, your bhabhi or sister in law. She has come to this family and brought happiness. With you as well she shares a very special bond. So, this time make sure you buy rakhi for bhaiya bhabhi online. After all, she is the better half of your brother and she too has a part in the relation, joys, and sorrows of the life of your brother. So why not make this Rakhi a memorable one for her as well. This time we have brought a wide variety of beautiful and gorgeous lumba Rakhi for bhabhi which include the jewel Rakhis, Rakhi made of silver metal, zarodsi Rakhi, pearl rakhi or the ones made using stones all in different colors designs and patterns. Pick a colorful one or something exclusive. At Floweraura we have products that suit every taste. Send lumba rakhi online to your sister in law and convey your wishes. If your brother and sister-in-law lives in a different city say Delhi then, now you can send a rakhi to Delhi online for your brother along with a lumba rakhi for your bhabhi via FlowerAura’s same day delivery. You don’t have to worry about our delivery time at all as FlowerAura delivers rakhis, gifts, flowers, cakes, and other gifts in more than 200+ Indian cities so that every person can make their special occasions memorable.